Most corner tubs are triangular in shape, but the inside of the tub can be very different. The bathing area can be an oval with a seat, cloverleaf in shape, or also be a triangle. 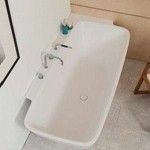 Corner bathtubs have become very popular for master baths since they can provide room for two bathers in a compact area. For instance, the Neptune Ariane (pictured above) has been a popular bathtub through the years. This 60" triangle bathtub has two bathing wells. One a little over 53" long, the second almost 43" long. Plenty of room for two bathers to sit side-by-side. In fact, most rectangle 60" tubs have a floor length under 43". 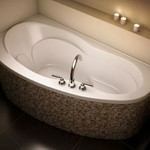 We carry quality bathtubs with strong warranties. Our tubs come to you factory direct and we pass those savings on to you, giving you high quality at reasonable prices. You don't have to wait for specials, search for a coupon, or cross your fingers and hope for a good deal. Our corner bathtubs are always on sale. We will ship our tubs anywhere in the contiguous US free of charge. For easier shopping choose size below. Then click on the tub picture to find out more about sale prices. Many corner bathtubs have a triangle bathing area with up to 3 backrests. 2 bathers can sit face to face or side-by-side. But not all corner tubs are designed for 2 bathers. Pictured above with the is the Neptune Wind. It has an oval bathing well and an end drain, this bath was designed for one bather. As you shop our corner tubs you will see the top view so you can see how the inside is designed. 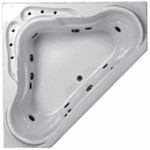 The tub's technical sheet will give you the interior measurements. Many of the corner tubs are drop-in. You will create a skirt to cover the front of the tub. Some have an integral skirt, others offer a skirt as an option. See the tub description to see if a skirt is a possibility. And not all corner bathtubs are triangle in shape. These two tubs are rectangular with a two sided skirt. The Americh Bow is perfect for a traditional bath with a rounded corner, the Flory De Colt is a modern bathtub. 60" x 30" x 21"
65" x 31" x 21"
60" x 32" x 21"
We have a large selection of quality tubs listed on our site which can feel overwhelming as you shop through them. Just call us: we have been doing this for so long we have become tub experts. We work closely with our manufactures and pride ourselves on our product knowledge. Our experts are here to answer all questions and guide you through your tub selection. We also know that buying such a large item on line can be scary. Rest assured we only carry tubs that we would feel comfortable putting in our own mother's house. And we have done just that! 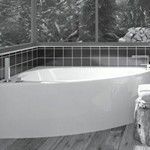 Our bathtubs are the best in the industry and we have years of experience with the manufacturers. Issues are very rare, and if they do arise, they are quickly resolved. We are here to answer questions and keep you informed on the creation and delivery of your bathtub. We will still be here for questions even after your new bathroom is finished.